Prime Minister Sheikh Hasina on Wednesday discarded her official car and preferred to walk down along with her younger sister Sheikh Rehana over half a kilometer to get on board a helicopter to return to the capital after offering prayers at Bangabandhu’s shrine in Tungipara. Officials and witnesses said the official car was ready to take her to the helipad, over half a kilometer away from her village home in Tungipara, but she preferred to walk down the village route along with Sheikh Rehana. 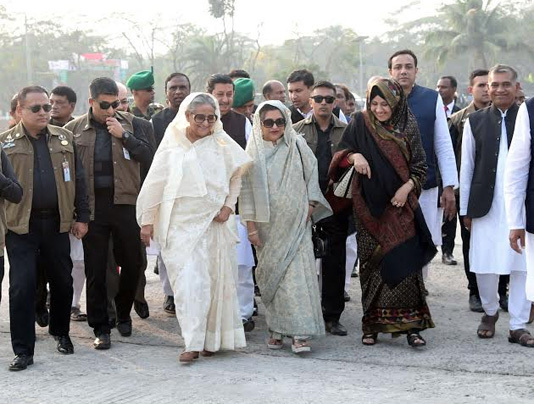 “There is no need to use car, this distance could be crossed on foot,” she told her officials and security personnel, who then accompanied the Bangabandhu daughters up to the helipad along with local leaders of Awami League. The premier earlier today arrived at Tungipara to pay homage to Bangabandhu offering wreaths on the shrine at Tungipara, also her ancestral home, to mark the beginning of the third consecutive term of her government after the December 30 elections. The premier paid her tributes by placing a wreath on the shrine and offered prayers seeking divine blessings for the victims of the August 15, 1975 carnage and peace of the departed souls. Sheikh Hasina also led her colleagues in the new council of ministers and the ruling Awami League in offering another wreath there. The two sisters, who survived the August 15 carnage as they were aboard at that time, later joined a milad and doa mahfil and recited from the holy Quran at the Bangabandhu shrine. Awami League President Sheikh Hasina took oath as the prime minister for the fourth time, the third in a row, heading a 47-member council of ministers on Monday, a week after the Awami League-led Grand Alliance’s landslide victory in the 11th parliamentary election. The new council comprising 24 ministers, 19 state ministers and three deputy ministers used buses to reach Tungipara , two days after their swearing in with President Abdul Hamid administering their oath of office alongside Sheikh Hasina.